Born in 1955, Benny Ration has been smithing silver since age eleven. His specialty is three-dimensional figures, often including hand-fabricated holloware kachinas made into pins, pendants and necklaces and shadowbox pendants with cut-outs. He is particularly adept in "saw and file work" which he often uses to sculpt the edges of his pendants. Additional biographical information and photos of Benny's work can be seen on page 268 of American Indian Jewelry I: 1,200 Artist Biographies by Dr. Gregory Schaaf. This is an example of Bennie's renowned saw and file borderwork surrounding this deep crimson piece of Mediterranean red coral. The coral is set in a smooth bezel. 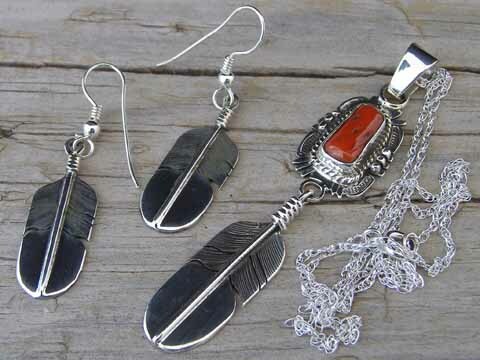 A free-swinging feather is suspended below the stone and a matching pair of Sterling feather earrings on hooks accompany this set. The pendant is strung on an eighteen-inch Sterling chain which rounds out this set. Hallmarked BENNIE RATION under a set of eagle talons and stamped Sterling on the back of the pendant. Red Coral: 1/2" x 1/4"
Pendant (excluding feather, bale & jump rings): 7/8" x 9/16"
Pendant feather: 1 3/8" x 7/16"
Total hang of pendant (top of bale to tip of feather): 2 3/4"
Earring feathers: 1 1/8" x 3/8"
Total hang of earrings: 1 3/4"
Length of Sterling chain: 18"